The Poinsettia is a member of the euphorbia family and is native to Mexico and Central America. In tropical regions it grows year around and is grown as a shrub or small tree, reaching heights of 2 to 15 feet (.6 to 5m). As a potted plant, it is primarily used as an indoor holiday decoration for the Christmas season, in fact it is the most popular potted flower sold in the United States. The plant is named for Joel Poinsett, the first U.S. Ambassador to Mexico who brought the plant to the U.S. in 1825. The most popular color, traditionally, is red, but they also come in white, salmon, pink, and variegated colors. What most people think of as the flowers are large colored bracts, or modified leaves that surround the flowers which are actually the yellow parts at the center of the bract. While poinsettias have long been said to be poisonous, this is not the case. In fact, a study at Ohio State University showed that a child weighing 50 pounds who ate 500 bracts might have a slight upset stomach as a result. While most people keep the plant for its holiday decorative value and discard it once it starts to decline they can be kept all year long and will re-bloom when cared for properly. Cuttings can be taken which root easily and new plants can be created in this way. The tricky part of getting them to re-bloom is that they need to be handled properly all year long. 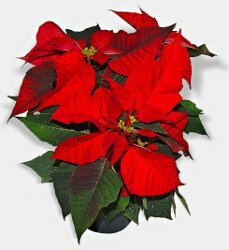 The Ohio State University has an excellent article on post-holiday Poinsettia care. Care for these plants is fairly easy if you just keep them for the holiday season. The care starts before you leave the garden center with your purchase. Being tropical plants, they do not like the cold at all. Make sure that the plant wrapper is pulled up for protection before you leave the store. Once you get it home, keep the soil moist but not wet, in a sunny location, keeping it away from hot or cold drafts.